Results: Sasha Banks and Bayley defeated Alexa Bliss and Nia Jax; Cedric Alexander defeated Noam Dar; The Miz (c) defeated Heath Slater (Intercontinental Championship match); Seth Rollins defeated Curt Hawkins; Neville defeated Mustafa Ali; Finn Balor defeated Cesaro; Braun Strowman defeated Apollo Crews. It’s a bit surprising to see a Monday Night Raw start with a video package recapping the Enzo Amore-Big Cass feud, what with WWE having Joe-Lesnar and Strowman-Reigns ready to go this Sunday, but it’s quickly clear that there’s a reason for that package starting the show. It’s because somehow, some way, Enzo Amore and Big Cass have made this heel turn work. They’ve taken a one-note (and very profitable) tag team and given them some depth. 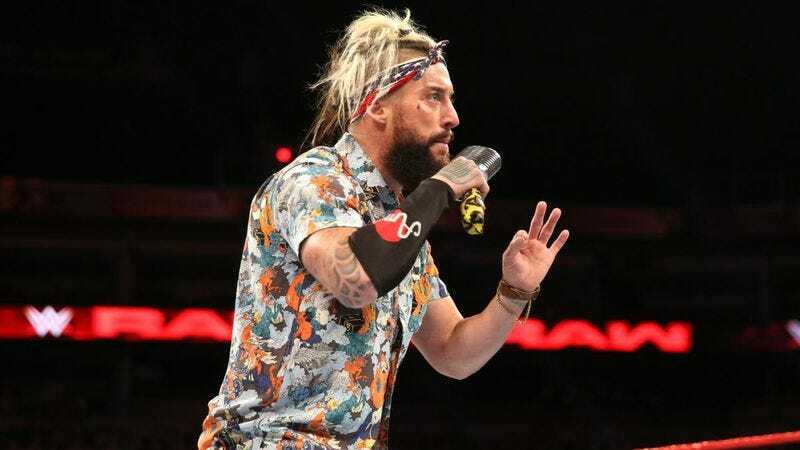 It’s rather remarkable, and while the heel is the one that usually benefits the most from a turn, or at least gets the more interesting material to dig into, it’s Enzo Amore that’s been the star. After last week’s attempted reconciliation, he’s here this week to put the nail in the coffin of his relationship with Cass. He starts listing everything he brings to the table as a performer and wrestler before talking about how grateful he is that he doesn’t have the shifting morality of a guy like Cass. Then, as if that doesn’t add enough depth to the character, he starts spitting some real truth about how he’s always been the draw. 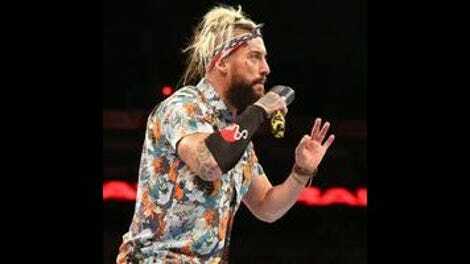 While Cass was looking ahead and feeling dragged down by his partner, Enzo was making a real impact, one that can be seen at every WWE show where countless people walk around in Certified G shirts and kids put on wigs and dance like the Realest Guy In The Room. “You’re nothing but a seven-foot catchphrase…that I wrote,” he says. It’s scathing, angry, and impassioned, and it’s a version of Enzo we’ve never seen before. I can’t quite believe it, but I am fully invested in Enzo as a singles wrestler, and all the credit goes to him and the way he’s been able to dig into real, relatable emotions. If I told you that Great Balls Of Fire opponents Sasha Banks and Alexa Bliss ended up facing off against each other this week as part of opposing tag teams, could you guess the outcome of the match? Yes, yes you could. I love that Braun Strowman doesn’t have any other mode except intense. When he’s telling Kurt Angle that Roman Reigns isn’t going to be able to compete at the PPV on Sunday it’s not just “did you see what I did to him?” Instead, he goes to “I felt his body go limp.” Truly the Monster Among Men. Does anyone have any idea why, or how, the Noam Dar-Alicia Fox-Cedric Alexander story is still going on? I swear we’ve seen approximately eight different resolutions to the storyline in the last few months. Let’s move on already; this story isn’t doing anyone any good. WWE is really sticking with “The Miztourage” for Bo Dallas and Curtis Axel. Bo Dallas putting on a suit, one glove, and a headband is every single attempt I make at dressing up for summer wedding season. WWE has a habit of making every single segment involving a PPV competitor feed into their current feud, even if it doesn’t exactly fit. Take tonight’s great match between Finn Balor and Cesaro. There’s really no reason why the Hardys need to be on commentary or involved in the match. They’re not adding anything to the feud or the story being told. It’s paint by numbers storytelling. Just because Cesaro and Sheamus are in the ring doesn’t mean their PPV opponents need to be nearby. Why not shake up the formula every now and then? Show the Hardys training for their 30 Minute Iron Man Match, and have Cesaro and Sheamus beat the hell out of Finn Balor then cut a promo warning the Hardys about what’s coming to them on Sunday. Just do something different. With that said, that’s a real fun match with a chaotic finish that undeniably works, with the crowd going nuts for Balor. Even the inevitable confrontation between Roman Reigns and Braun Strowman doesn’t feel all that different from their past run-ins—hey look, another ambulance!—but at least the feud is hot enough that it doesn’t really matter. You could put Reigns and Strowman in nearly the exact same segment week after week and it’d go over like gangbusters. There’s just so much there to love. Plus, this week we get Strowman kicking Apollo Crews across the ring when he attempts his standing moonsault. Booking one feat of strength for Strowman every week is a great strategy. Feuding with Bray Wyatt is the go-to spot for “top guy that WWE has no idea what to do with right now.” Sorry, Seth. How about Heath Slater hitting a top rope powerslam on the Miz? Move of the night, if it weren’t for Strowman. The alignments in the Joe-Lesnar feud are very intriguing. Both are tweeners to an extent, but Lesnar comes across as a protected corporate champion during this week’s split screen interview segment. With these two guys it doesn’t really matter, but it’s a little weird to see Lesnar avoiding a fight. Perhaps it’s a sign of just how terrified he is right now. He’s never encountered someone like Samoa Joe before. That takes us to Sunday, and Great Balls Of Fire. It’s been awhile since Raw‘s had me this excited for a PPV, and I have high hopes that they’ll follow through. There’s a lot of potential on the card, even if the tag title match and a meaningless fight between Rollins and Wyatt threaten to drag out the evening. Here’s hoping Bliss, Banks, Strowman, Reigns, Joe, and Lesnar do more than enough to make the PPV one of the better ones of the year.